This Friday is Take Your Dog To Work Day, a great chance for offices to open their doors to our beloved four-legged family members. Although Take Your Dog to Work Day occurs just once a year, more companies are recognizing the perks of having pets in the workplace and offering employees the option of working alongside their faithful companions. 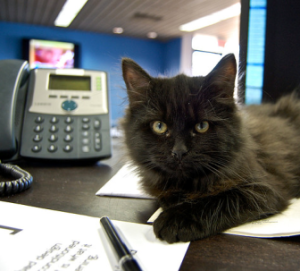 Cats can make purr-fect officemates. Companies such as St. Louis’ own Purina and Build-A-Bear, along with Amazon, Google and Ben & Jerry’s, all allow furry friends to accompany their pet parent during their 9-5. Research is showing that it’s not a bad idea at all. A 2012 study from Virginia Commonwealth University showed that the stress hormone cortisol was lower, much lower, among workers who brought their dogs to work than those who did not. The Indianapolis Star reports that, as the workday progressed, researchers found stress levels dropped 11 percent among workers with pets, while they increased 70 percent among those who were without their animals. The Centers for Disease Control and Prevention also cites lowered blood pressure and cholesterol levels as benefits of having pets around. As if that weren’t enough reason to put your pet in your cubicle, companies with pet-friendly policies also report that employee morale receives a boost, coworker relationships improve, physical activity levels are higher and employee turnover is lower when pets are around. Purina sees so much benefit in allowing pets in the workplace that they have initiated the “Pets At Work” campaign that emphasizes the perks of animals in the office and helps companies get started with their own pet-friendly policies. So, the next time you approach your boss about bringing Fido or Kitty to work, just let him or her know that you want to do it for the good of the company. They might just consider it. The summer is here, and it’s a great time to have fun outdoors with your pets. Just remember to keep them safe from certain warm weather dangers with these tips. Be an early bird or night owl. Exercise your dog in the cool of the early morning or later evening. Daytime heat can overwhelm even the most fun-loving pup. The interior of cars reaches incredible temperatures during the summer, even with the windows down. Never leave your pet in the car during the summer, not even for a few minutes. Always provide plenty of shade and cool water for pets staying outside. A properly constructed and properly placed dog house will protect your dog from the sun. If possible, allow your pet to just stay indoors to enjoy the A/C. 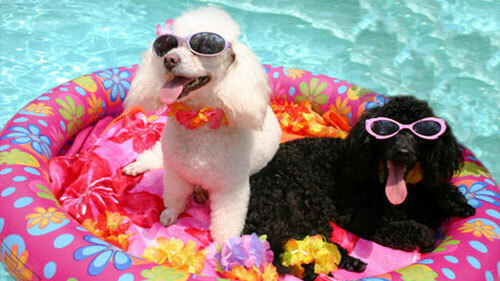 Be especially sensitive to old, young or overweight pets in the hot weather. Keep them out of the heat as much as possible. Be careful about walking your pet on hot asphalt. Dogs’ paws do burn. Coolant, even in tiny doses, is a lethal poison for dogs and cats. Because of its sweet taste, animals are attracted to it. Clean up any spills from your vehicle and always store coolant in a safe place. Be sure there are no open, unscreened windows through which your pet can jump or fall. Beware of too short summer cuts. 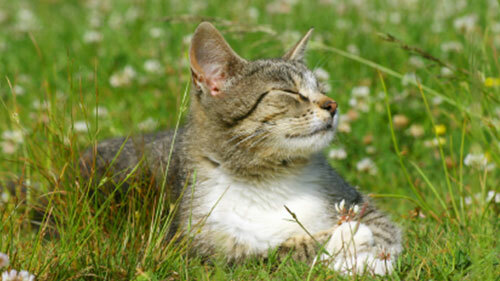 Dogs and cats get sunburned, too! You can trim longer hair for the warm weather season, but do not shave your pet. Talk to your veterinarian about keeping your pets well-groomed and find out if a haircut is best for your furry friend. When it comes to heartworms, ticks, and fleas, an ounce of prevention is worth a pound of cure. Keep those pets safe from common summer parasites by giving them monthly flea, tick and heartworm preventative.